The Chosen Guardian and Princess of Hope, hailing from the Garden of Light. 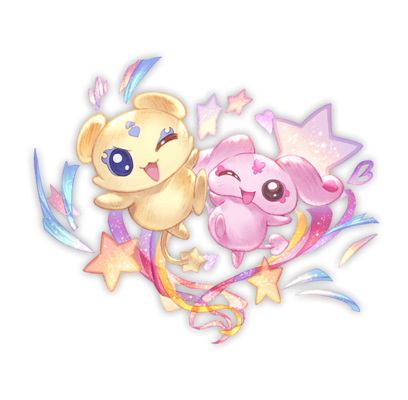 These two adorable creatures bestow power upon the legendary warriors known as Pretty Cure, in order to fulfill their mission of ensuring the survival of all worlds. Their pure hearts are capable of engulfing darkness and bringing the light of hope to others. Medium boost to all allies' ATK and DEF / Remove 1 debuff from Pretty Cure 9T9 turn cooldown. This page was last modified on 5 February 2019, at 04:18.